Allelic dropouts are an important source of genotyping error, particularly in studies using non-invasive sampling techniques. 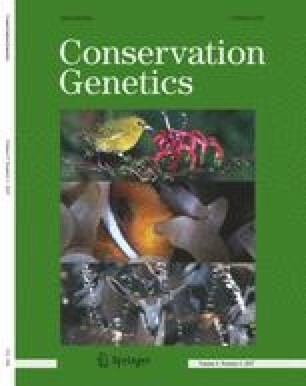 This has important implications for conservation biology, as an increasing number of studies are now using non-invasive techniques to study rare species or endangered populations. Previously, allelic dropout has typically been associated with PCR amplification of low quality/quantity template DNA. However, in this study we recorded high levels of allelic dropout (21–57%) at specific loci amplified from a high quality DNA (63.1 ± 7.8 ng/μl) source in the red fox (Vulpes vulpes). We designed a series of experiments to identify the sources of error. Whilst we were able to show that the best method to identify allelic dropout was the dilution of template DNA prior to PCR amplification, our data also showed two specific patterns: (1) allelic dropouts occurred at specific loci; (2) allelic dropouts occurred at specific pair-wise combinations of alleles. These patterns suggest that mechanisms other than low quantity template DNA are responsible for allelic dropout. Further research on the causes of these patterns in this and other studies would further our understanding of genotyping errors and would aid future studies where allelic dropout may be a serious issue. We are grateful to the Natural Environment Research Council (CDS), Rotary Foundation of Rotary International, Newby Trust Ltd and the Sir Richard Stapley Educational Trust (GI), the Biotechnology and Biological Sciences Research Council (KJE), the International Fund for Animal Welfare (PJB) and The Dulverton Trust (SH) for financial support. We are also grateful to Jane Coghill of the University of Bristol Transcriptonics unit for processing the MegaBACE samples.